The team at Digital Wave Technologies comprised Shane Bouslough, Steve Camas, John Mitchell, and David Asher. Around 1986-1987 the team completed a prototype of the first audio mixer controlled by MIDI. The mixer was rack-mounted - which was an innovation in itself since it needed no control knobs because all mixing parameters were controlled by MIDI signals. For each of 8 stereo input audio channels it controlled volume, balance, and basic treble and bass filtering, with master volume on the stereo output. An 8088-based embedded computer controlled the device, with a vacuum-fluorescent display for visual feedback. 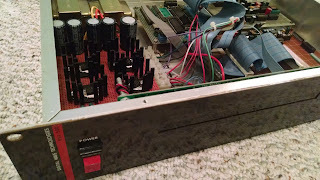 Since the audio elements were all analog, we needed a way to produce more than 64 control voltage signals. Instead of lining up lots of D/A converters, we created a "dynamic analog memory" where voltages were held by a capacitor and op-amp buffer and frequently recharged by a single D/A converter.